MONTREAL -- Johan Garpenlov's wrist shot beat goaltender Jose Theodore with 3:30 left in regulation to lift the Florida Panthers into a 2-2 tie with the Montreal Canadiens Monday. Garpenlov's score, which was created by a fake shot and ensuing screen, was his eighth of the season and spoiled an otherwise terrific performance by Theodore. Theodore, a last-second replacement for flu-ridden Jocelyn Thibault, turned aside 39 shots. "I was happy to see Theodore step in at the last minute," Canadiens coach Mario Tremblay said. "He only found out at six o'clock that he was going to play. The Panthers had more than 40 shots, we have to find a way to cut down on the shots. We sat back in the third period and tried to win the game 2-1. We lost a key faceoff and they got the tying goal." "I would have liked more notice," Theodore said. "I wish I would have found out sooner that I was starting tonight, but as an athlete, you have to be ready." Garpenlov admitted the goal was more good fortune than skill. "I don't know how I scored the goal, it was a desperate shot, maybe it hit (Rob) Niedermayer," Garpenlov said. "With Ray Sheppard out of the lineup, you have to take more shots, I have to work harder and go get to the net." Martin Rucinsky and Vladimir Malakhov scored for the Canadiens while Scott Mellanby had the other tally for Florida. Neither team had a good chance in overtime but Montreal did register three shots. The Canadiens, who are 1-0-2 in their last three, have allowed 30 shots or more in 13 consecutive games. "Some people don't think a tie is important," Rucinsky said. "But in our last two games, we did get two ties. We played two top teams, New Jersey and Florida and just to tie them, that's big for us." Florida goaltender Mark Fitzpatrick stopped 22 shots and saw his record move to 8-4-4. "We had a lot of great opportunities, we had a lot of great chances, we battled hard," Florida coach Doug MacLean said. "Both teams were desperate in the third but we got a big punch, we had a big jump in the third period. I was getting nervous, I thought we'd lose. It's a tie that that gives us confidence." Montreal broke on top 8:31 into the game when Rucinsky capitalized on a power-play opportunity. Mark Recchi, playing in his 600th game, slipped a backhanded pass to Rucinsky at the right side of the net. Rucinsky then pushed the puck low along the ice just past Fitzpatrick's glove side. Florida knotted the score just over 5:30 later when Mellanby converted the rebound of a Rob Niedermayer pass and beat Theodore with a wrist shot low to the stick side. Malakhov's fourth goal of the season, and first since Nov. 23, snapped the tie six minutes into the second period. Rucinsky drew Fitzpatrick out of the net and slid a cross-ice pass to a streaking Malakhov who pushed it into an empty net. Florida, which is 4-1-1 in its last six, was playing without Sheppard, the team's second-leading scorer. Sheppard will be out four to six weeks after suffering a right knee injury in Saturday's loss to Washington. In other Panthers news Monday, right wing Ray Sheppard underwent an MRI and will be out four to six weeks with a sprained right medial collateral knee ligament suffered in Saturday's 3-1 loss to the Washington Capitals. Sheppard, who has 20 goals and 22 assists in 48 games this season, collided knee-to-knee with Peter Bondra and has heavy swelling in the knee. The swelling must go down before the knee can be re-evaluated on Sunday or Monday, though general manager Bryan Murray feared that the injury might be season-ending. Bondra was given a major penalty on the play and was suspended for at least one game pending a hearing. 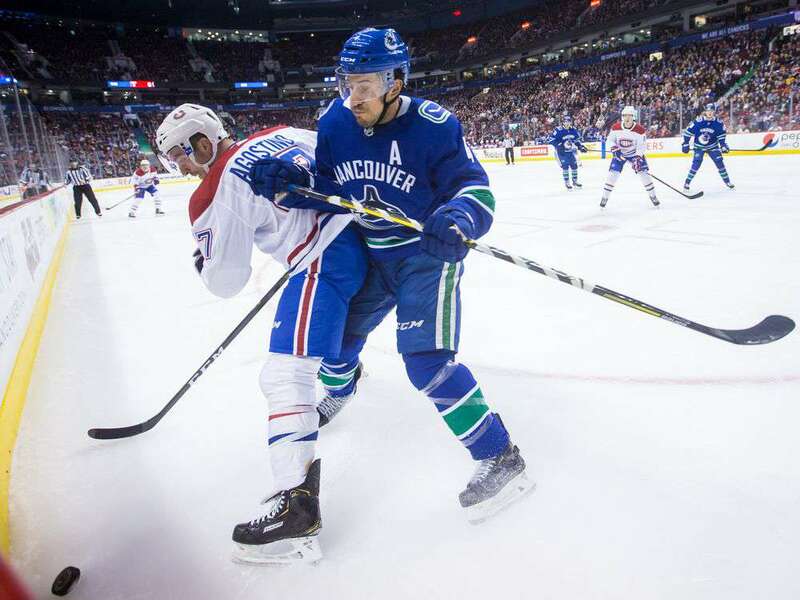 -- In Ottawa, Shaun Van Allen scored twice during a three-goal first period and Alexei Yashin had a goal and two assists as the Ottawa Senators held off the Vancouver Canucks, 6-4. Steve Duchesne had a goal and an assist and Janne Laukkanen and Randy Cunneyworth set up two goals apiece for Ottawa, which improved to 5-2-3 in its last 10 games. The Senators swept the season series from Vancouver and recorded double-digit wins at home for the first time in their five-year history. Ottawa built a 5-1 lead and had a three-goal advantage entering the third period, but David Roberts scored on a wrist shot from the slot, his eighth goal, at 5:55 of the final period to pull Vancouver within 5-3. Mike Ridley's 15th goal with 8:24 remaining made it a one-goal game. Ridley deflected Alexander Mogilny's backhand pass by goaltender Damian Rhodes, capping a 3-on-2 break. The Canucks had heavy pressure in the Ottawa zone before Senators winger Denny Lambert made a perfect breakout pass to Alexandre Daigle, who converted the ensuing breakaway for his 20th goal with 78 seconds left, sealing the victory. -- In Calgary, Stephane Fiset made 39 saves, including 15 in the third period, and Ed Olczyk and Kai Nurminen scored second-period power-play goals, leading the Los Angeles Kings to a 3-2 victory over the Calgary Flames. Yanic Perreault tallied a shorthanded goal in the second period for the Kings, who improved to 2-5-1 in their last eight games. Los Angeles had scored just one goal in going 0-2-1 in its first three meetings with Calgary this season. Theo Fleury's 22nd goal of the season 7:54 into the third peiod pulled Calgary within 3-2, but the Flames would not beat Fiset again. Fiset made glove saves on German Titov and Yves Racine in the final five minutes to preserve the win. The Flames pulled goaltender Trevor Kidd for an extra attacker with 90 seconds remaining, but couldn't get a shot on goal. Steve Chiasson also tallied for Calgary, which is 2-2-1 in its last five. -- In San Jose, Ulf Dahlen's third goal in as many games snapped a first-period tie, leading the Chicago Blackhawks to a 4-2 victory over his former team, the San Jose Sharks. Tony Amonte took a shot that San Jose goaltender Kelly Hrudey saved, but Dahlen poked the rebound over the goal line from behind the net for his 11th goal and a 2-1 lead with 77 seconds left in the first period. Chicago's three-game winning streak is its longest since a four-game streak from Oct. 15-24. Chris Terreri made 38 saves and improved to 7-10-3. Terreri, Dahlen and Michal Sykora were traded to Chicago for goaltender Ed Belfour on Jan. 25. Hrudey made 34 saves and fell to 12-15-2 as the Sharks failed to win three straight games for the first time this season.